I gave myself an extra difficult challenge today. 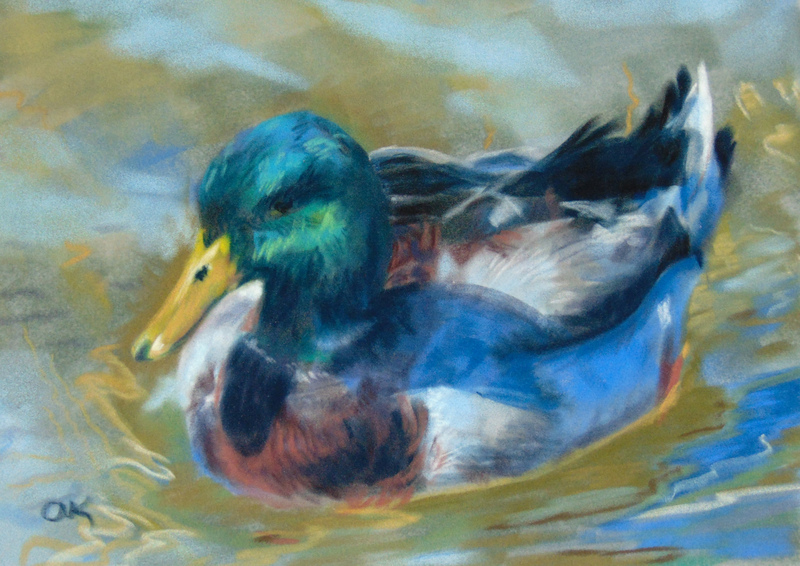 This is the first time I’ve tried to draw or paint a duck. But when I saw them at Beaverdam Park on Saturday and they were so cooperative with getting their photos taken, I knew I wanted to give it a try. But, of course, I could not make it easy on myself. Printing out photos on my printer just never seems to capture colors very well and the values get very odd. So, I decided to upload the images to Dropbox and use my iPad as my reference photo. This worked great with the colors, although I think my camera still does odd things with value. For example, the shadow under the duck’s face is probably too dark and I could not make out the feather shapes on his back at all. I did discover that the iPad is rather heavy. I don’t have a stand for it at the moment, but I have a music stand at the other house (I think), that might just do the trick. I also discovered that pastel will transfer from my gloved fingers to the action button on the iPad as it timed out a few times while I was working and I had to click that button, leaving dust behind on the machine. I may be able to adjust that. To make things even more challenging, I decided to use a sheet of blue grey velour paper. It’s not my favorite but did take several layers of pastel. Finally, when I photographed the painting, it seemed to go just a little bluer than the original.. I know that is a tendency for my camera, but it seemed more pronounced today for some reason. In the end, I also cropped off some of the “water” from the top so the finished size is about 8X12 and not the whole sheet of paper at 9X12.